Robin String Trimmer is a part of the Robin Equipment Power Line. The company has it’s roots stretching back several decades. Some will remember the Wisconsin brand of large 4 cycle engines that were legendary in the 1970’s. The brand later changed to Wisconsin-Robin, and subsequently changed again to Robin Power Equipment. Robin manufactures an impressive array of equipment, to include some very good string trimmers. The engineering is among the very best available from any string trimmer manufacturer on the market today. The Robin String Trimmer line has dealt with the emissions problem inherent in small 2 cycle engines by providing both a 4 cycle and 2 cycle engine design. The 4 cycle engines do not require oil to be mixed with the gas, but there are more moving parts in the engine to contend with. Engine weight tends to be higher, also. If there is any criticism of the Robin trimmer line, it is the anemic dealer support network. It can be hard to find dealers for these great machines. The support structure just does not seem to be in place for the US market at this time. In fact, it was impossible to find prices on the units described below. Three of the Robin string trimmer models are powered by the 4 stroke engine engine design. Since the emissions are lower, these units are more popular in California, where there are stricter emission regulations than the rest of the country. All of the 4 cycle trimmers are the straight shad=ft design, and all can be equipped with a brush blade for the really tough jobs. 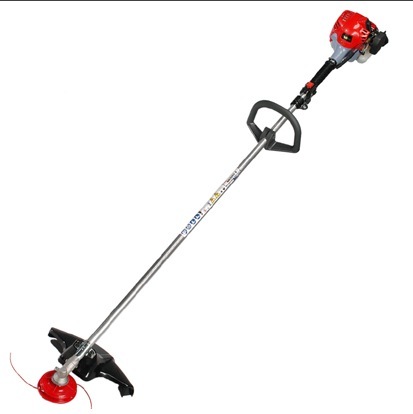 Robin string trimmers has the 2 basic versions - straight shaft and curved shaft. Robin takes the string trimmer seriously - only one model has a curved shaft, and is described as a ‘light duty’ trimmer. Starting with the 2 stroke trimmers, the Robin Model NBF252 is a standard light duty trimmer equipped with 24.5cc displacement 2 cycle engine. The shaft length is 52”, and the entire machine weighs a suprisingly light 9.3 lbs. The handle is a standard loop variety. The cutting head is semi-auto, which is the standard for all models of the Robin string trimmer. Line is provided from the head when needed. Next in the light duty 2 stroke category is the Robin Model NB2050 . This perky trimmer sports a straight shaft design, measuring 57” in length. The engine is the smallest in the Robin line, with 20.0cc displacement. The smaller engine contributes to the lower weight of 8.4 lbs, which could make a big difference at by the end of the lawn. The cutting head is semi-auto. A shoulder harness and steel cutting blade is optional. Moving up to the professional grade 2 cycle trimmers, the Robin Model NB2250 has 57” solid shaft, 9.3 lb weight, optional harness and steel cutting blade. The standard cutting head is semi-auto feed. A shoulder harness and steel cutting blade is once again optional. The engine is a slightly smaller 21.7cc displacement. The next professional grade 2 cycle trimmer is the Robin Model NB2450 , which has 57” solid shaft, 9.7 lb weight, optional harness and steel cutting blade. The standard cutting head is semi-auto feed. A shoulder harness and steel cutting blade is once again optional. The engine is a larger 24.5cc displacement. Count on spending $.00 for this gazelle of the yard. Robin string trimmer also offers several more environmentally friendly 4 cycle engines. The Robin Model BH2500 has a 24.5cc displacement engine. The larger 4 cycle engine is evident in the increased weight of this machine - 11.6 lbs. Steel shaft is straight, and measures 57” in length. The semi-auto cutting head once again is standard, but this baby packs enough power to make you wonder if you should equip the trimmer with the optional steel cutting blade and harvest some Christmas trees on the side for some extra income. The Robin Model BH3600AU has a 33.3cc displacement engine. This is the trimmer some homeowners might dream about - 17.4 lbs, double pad shoulder strap, bicycle handle, semi-auto head and a steel blade standard. This machine known no fear ( and no limits). The Robin Model BH3500AU is a very similar trimmer to it’s brother, but has a slightly larger 33.5cc four cycle engine. The Robin String Trimmer line features the best Japanese engineering has to offer. If you are looking for a top of the line homeowner machine, Robin has the model for you.